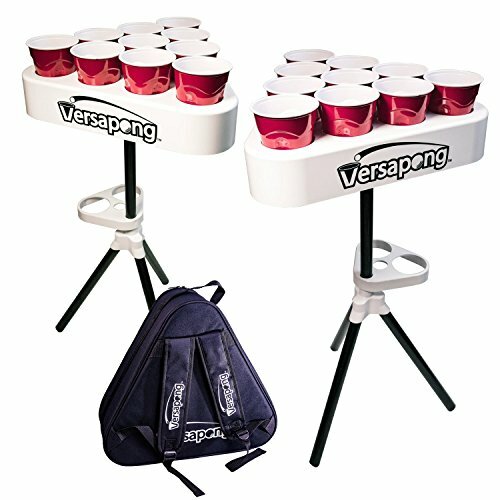 Versapong is a new lightweight, portable, inexpensive, convenient way to play the game of Beer Pong or if you prefer, Beirut. Each durable Versapong features two easily customizable racks, water-cup holders, sturdy tri-pod base and convenient travel case with backpack straps. Take it inside, outside, in a pool, tailgate, or on a boat, Versapong is waterproof, partyproof, and ready for anything. Even better? The set is lightweight, weighing only 7lbs, about one third the weight of your average pong table. Fully assembled, the cups sit at official regulation height of 27.5 inches, and when placed 8ft apart, are at regulation length. Plus, it only takes up about 10% of the space of your average beer pong table, so bring one to your next party! Easily customized and much smaller and lighter than a traditional table. If you have any questions about this product by Versapong, contact us by completing and submitting the form below. If you are looking for a specif part number, please include it with your message.